I have been having a play with some of my SU! Summer Mini Catalogue goodies. Today I have used the hostess set called Up In The Air. It has lovely soft lines with birds and branches and it is easily coloured in to create a pretty card. I have been wanting to do an easel calendar card for ages and this set works well with this idea in mind. I used Chocolate Chip cardstock for the base and added Marina Mist, Whisper White and Bashful Blue for a soft feminine look. The butterflies are from the Beautiful Wings Embosslit Die. The little calendar tears off and this would look pretty on a desktop or by the phone I am thinking. Paper: Chocolate Chip, Marina Mist, Whisper White, Bashful Blue & Subtles DSP. 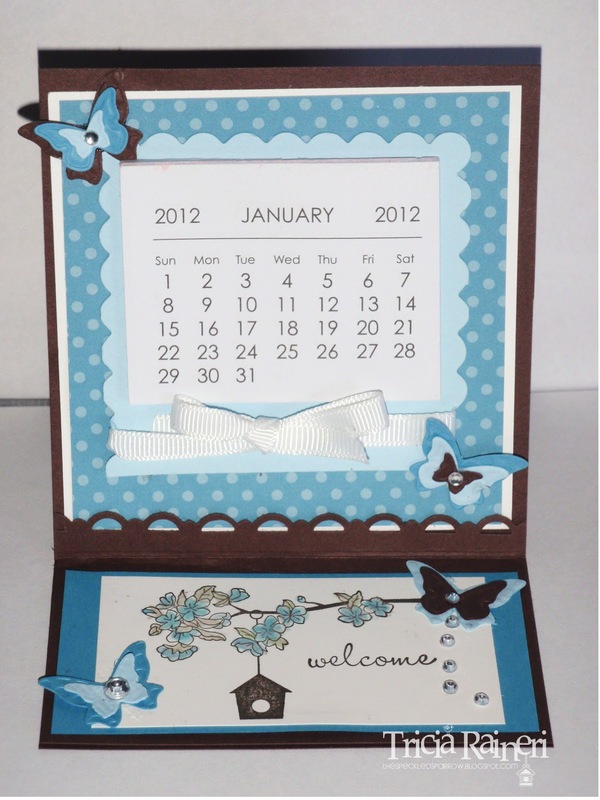 Cool Tools: Big Shot, Scallop Square Duo Die,Beautiful Wings Embosslit die, Jewels, Scallop Trim Border punch. Non-SU mini Calendar. Ribbon: Whisper White 1/4 " grosgrain ribbon.